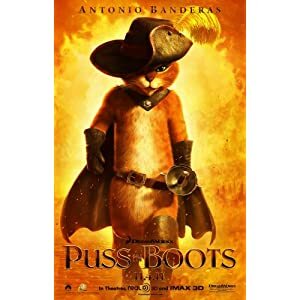 I've always liked the character Puss in Boots in the Shrek movies..he is cuter and less annoying than Donkey for the most part. Eddie Murphy just goes a bit overboard as Donkey at times. Puss doesn't seem to do that. As far as I can tell, this movie takes place before Puss meets up with Shrek. Some back story is shown that explains how Puss became an outlaw. He ends up meeting Humpty Alexander Dumpty again, a childhood friend. Things did not end well between them, so Puss is less than pleased to see Humpty again. They end up working together, along with Kitty Softpaws, to steal magic beans from Jack and Jill. They will then use the magic beans to get to the goose that lays golden eggs. The movie is cute and entertaining, though not quite as funny as I had thought it would be. Puss is shown as a kitten, and he is absolutely adorable in those scenes. The plot is pretty straightforward and nothing surprising happens, though children may be surprised by one or two developments. The animation is very well done. Puss's hair looks really good. It is closer to what Pixar did with Sully's hair in Monster's Inc., but it still isn't that good. But it is better than what DreamWorks has done in other animated movies. I did end up seeing the movie in 3D. That was alright, but nothing that special. DreamWorks has done better 3D with some of their other animated movies. Overall, this is a cute entertaining movie that is worth seeing for people who like animated movies. It is probably one of the better DreamWorks animated movies, but it still is no where near as good as Pixar.